The lobby of The Field Guide hotel in Stowe, Vt.
One of the rooms at The Taconic in Manchester Village. Two unique hotels recently opened in Vermont, seeking niche markets in two of the Green Mountain State’s most popular, four-season destinations. 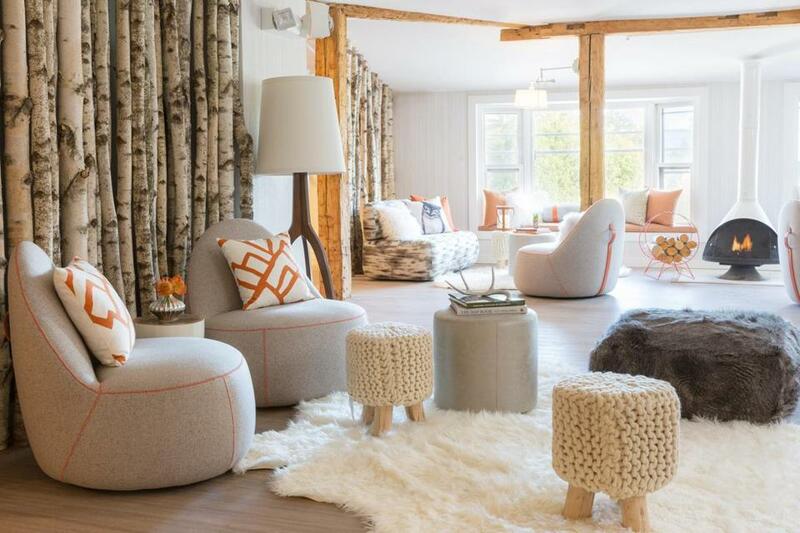 The Taconic, a boutique Kimpton property, opened in late 2015 in Manchester, and Field Guide, a design-driven Lark Hotel property, opened last fall in Stowe. 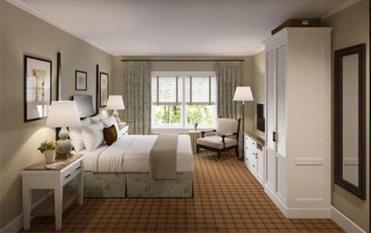 Both offer travelers new, contemporary lodging choices in favorite tourist hot spots. The Taconic (802-362-0147, www.taconichotel.com, rates starting at $199), named after the surrounding mountain range, is a modern take on the grand inns of the early 20th century, featuring a Main House and three private cottages, occupying 4 acres in the center of historic Manchester. The use of traditional, natural materials, including white-painted clapboard siding and wood shingles, along with a large, wraparound porch, helps the new construction fit into the existing landscaping and architecture of the area. A marble sidewalk (harking back to the days when the area was known for its marble quarries), porch columns, and French doors lead to the entrance, guest reception, and large living room with a stone-faced, wood-burning fireplace and original pieces from local artists and the Southern Vermont Arts Center. On the other side of the two-faced fireplace is The Copper Grouse restaurant and lounge. The designers are calling the bistro-style restaurant “rustically elegant,” seating 110 people, with a small exhibition-style plating kitchen and a large alfresco dining area. They’ve pulled in native Vermont chef Adam Raftery to direct a casual, regionally inspired menu. The Main House has 78 rooms with soft neutral palettes, oak furnishings, grass cloth wall coverings decorated with photographs and postcards of Manchester Village from the Historical Society, wood floors, and modern marble and tile baths; some rooms have gas fireplaces and sweeping mountain views. What really makes this property a standout are the special Kimpton touches and Vermont-inspired programming. There will be handcrafted Manchester Woodcraft walking sticks in every room, coffee and tea service (with maple syrup as sweetener, of course! ), and complimentary evening cocktail receptions that might include Vermont craft beer and cheese tastings. “We worked with the local cultural and artistic communities and residents who know the area well to offer a range of different, unique experiences for our guests,” says Jami Poe, director of sales and marketing. Upon arrival, guests may receive customized trek maps, leading to secret swimming holes, hidden waterfalls, and off-the-beaten-track snowshoe trails. There will be guided snowshoeing and cross-country ski outings, backcountry hikes, and excursions with a well-known local photographer. The hotel has also partnered with the arts center to offer guests an adult coloring book to use during their visit. Future exhibitions and contests of guest renderings are in the planning. “This is really a love letter to Manchester,” says Poe. The Copper Grouse restaurant at The Taconic in Manchester Village. The Field Guide (802-253-8088, www.fieldguidestowe.com, starting from $139) pays its own homage to Vermont, bucking traditional design and opting for a hip, playful approach. It looks nothing like its former self: the Ye Olde England Inne, a worn relic filled with heavy velvets and dark corners, which sat atop a knoll in pretty Stowe. But the location, just down the street from Stowe Mountain Resort (the town shuttle bus stops in front of the hotel) and with quick access to miles of trails, shops, breweries, restaurants, galleries, and more, can’t be beat. It’s no wonder Lark Hotels, which also has a handful of stylish, boutique properties in New Hampshire, Maine, Massachusetts, Rhode Island, and California, grabbed the 2½-acre parcel for a total rehab. And transformed it is. Walk into the lobby of this revamped property and you’ll enter a light and airy contemporary space, filled with white fuzzy rugs and pillows, artisan furniture, stacks of vintage field guides and nature magazines, and punches of bold color. Reclaimed wood walls, a birch log wall divider, tree-stump tables, and artwork that pays homage to Vermont’s great outdoors add an upscale, woodsy-lodge vibe, while high-tech amenities (sleek baths, Apple TV, and iPads for every guest room) keep it modern. Casual and comfortable with a bit of elegance and edge: They’ve hit that mark. There are 30 rooms and suites, which carry the same design vibe, with contemporary furniture, fun fabrics and colorful accents, including cardboard animal heads, skiers-on-the-mountain or birds-in-the-woods wallpaper, and live-edge wood headboards. Some rooms have gas fireplaces, private decks, soaking tubs, and valley and mountain views. The Picnic Social bar and restaurant located off the lobby (opening later this winter), will feature casual comfort food (think: fried chicken and burgers). 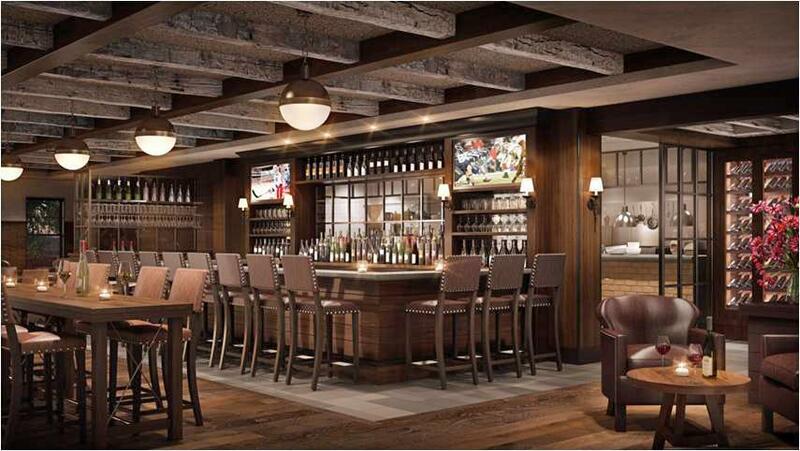 The restaurant also has a large, open terrace with built-in ceiling heaters, which could become Stowe’s next big après-ski hot spot. Or, grab a glass of champagne and head to the outdoor hot tub, housed in a gazebo, with peekaboo mountain views. 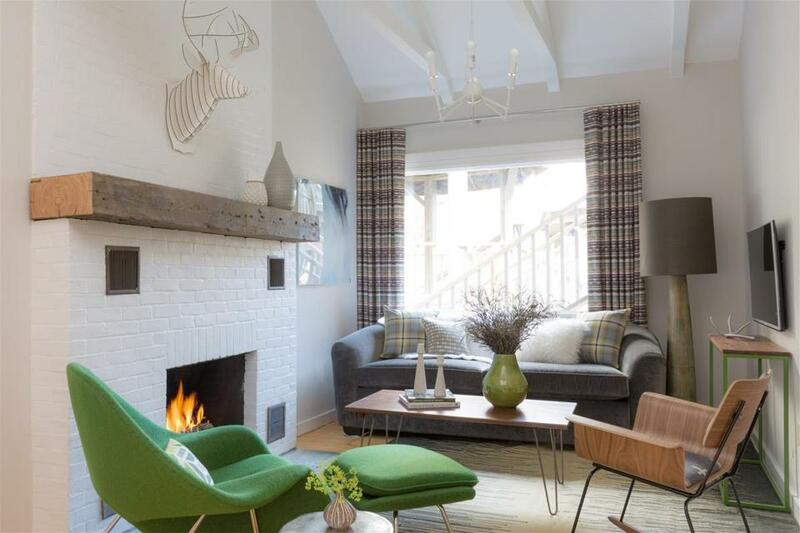 A room with contemporary touches at The Field Guide in Stowe, Vt.